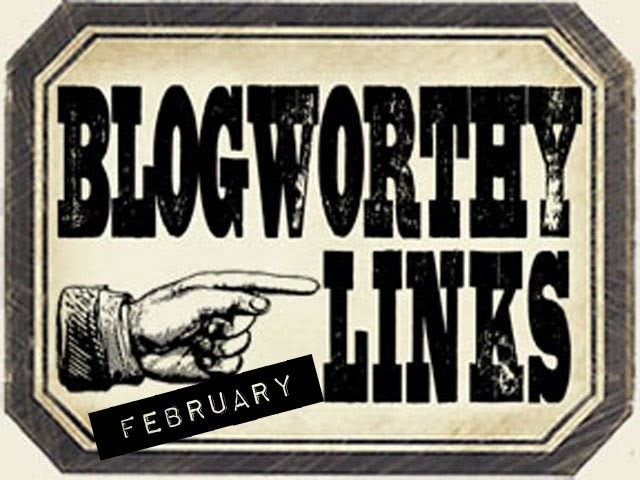 Well having been out of blogland for a while I have missed making Tim's gorgeous tags each month although I am planning to make all twelve and catch them up, so This month getting back into the swing of blogging gently I made it and this month Tim has a real delight of a tag for us . 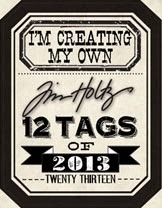 Tim's gorgeous tag can be found here and all the details about how he created it so there will be no details on my blog. I pretty much followed Tim step by step as I love to do this to explore and learn through the process, I did add a different embellishment and if you want to try hop across here to Tim's blog for all the step by step details . 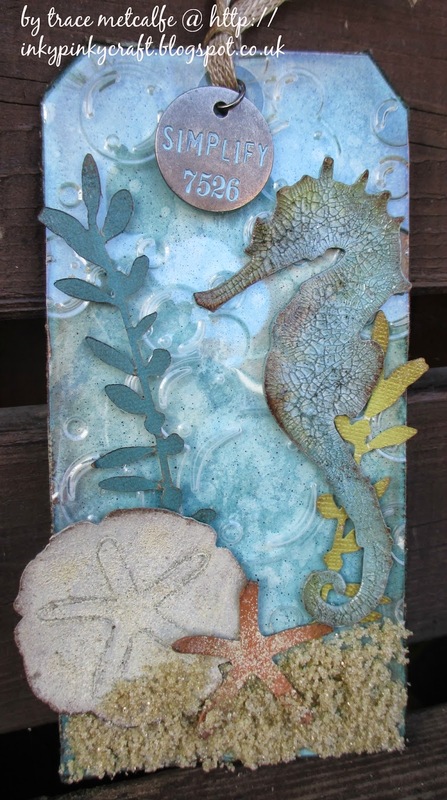 I loved the gorgeous sea horse..
And the sand was just so fun to make and just so scrummy! I decided to go all out with the stains for stamping, ribbon staining, background making and shattered stains... so here are some details and pictures . I stared by creating the background by applying Distress stains in rusty hinge and broken china to my craft sheet, spritzing my large tag and swiping through the stains... I spritzed some water onto tag surface and dried. Then I re dipped into the remaining stain droplets to get a more mottled effect and dried. 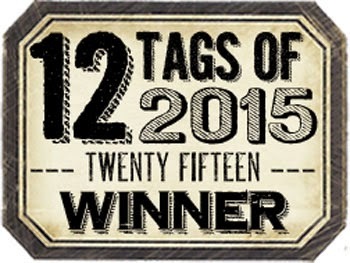 and stamped onto surface of the tag in bottom left and top right. To complete the tag background I added some rusty hinge and broken china distress ink to edges, dried and then edged with walnut stain. I added some die cut framework pieces and some inside pieces cut from various materials. ( sorry got carried away but here is one that shows the pieces in place ). Now for the butterfly, well my new die (oops dies)...had fallen through my letterbox...well actually a few more things fell in my basket and Mr Postie had to hand them in the door...but anyway it seemed rude not to play..so I die cut the butterfly from grungepaper and coated with clear rock candy and left to do its thing! When dry I added more stain in broken china, dried and then using a brush added some rusty hinge to body area an wing tips. I also flicked some perfect pearl diluted powder on for a bit of shimmer in areas. I added a sentiment, stamped in black archival and inked up in same colours and lots of dyed seam binding....using distress stains applied to craft sheet, spritz seam binding...dip into stain droplets and scrunch and leave over night to dry. Finally a philosophy token with distress paint rubbed over surface and into letters and then rubbed off with soft cloth so paint only stays in letters. 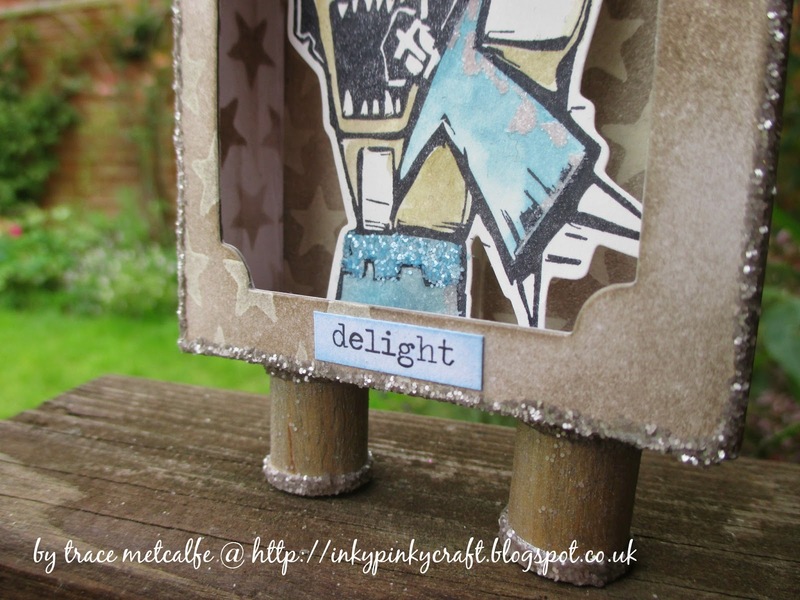 Delight in the little things - for Country View Crafts - A sneak peak . For all the details of how I created this please hop across here . 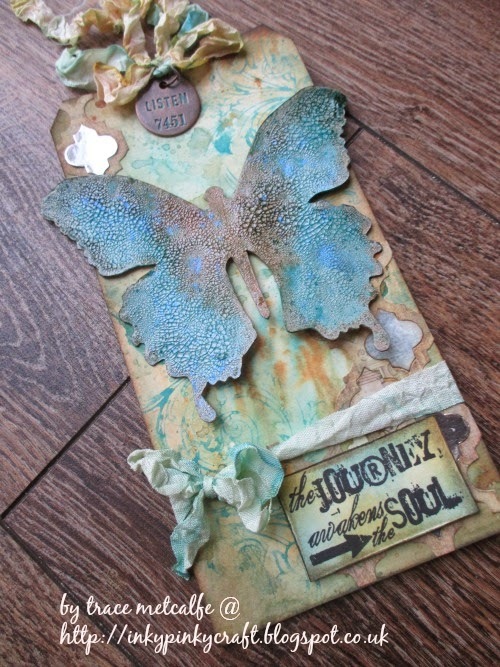 Now here is a how to , including all the dies and Tim Holtz goodies that went into creating this piece. I started by die cutting the block pieces and set too with distress inks and layering stencils. 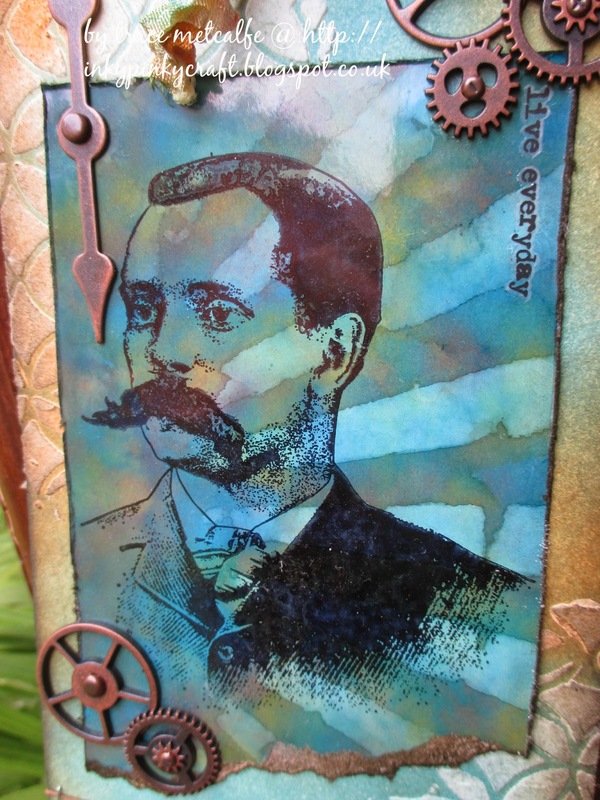 I started by applying some antique linen distress paint through Tim Holtz layering stencil. I applied it in random places and then left to dry. Once dry I applied some pumice stone distress ink all over the surface of the box and dried and then using another layering stencil added some more pumice stone distress ink through ( this time using clockwork stencil). Here is the outside of the box now all those yummy distress layers are completed. Inside the box I applied pumice stone through the arrows layering stencil , turning the stencil randomly to cover all of inside. Now for some of the details that will decorate and fill the inside....you know me and cogs and gears if you have been here before...so I die cut the gears ( a much loved Tim Holtz die) and inked with pumice stone DI, then sprinkled with cement embossing powder. before heating I tapped and wiped off some of the edges and then heat set. 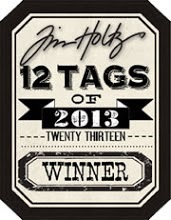 I created two large and two small tags and the inked the edges in black soot and also rubbed rusty hinge DI onto them . I also die cut some arrows from thick card and coloured with stains and then dabbed some antique brass distress paint and some rusty hinge distress ink onto them. Here are the faces of the ATB. For this side I added a die cut framework piece, coloured in walnut stain DI. I added lots of rub ons and some stamped elements . For this side I added another framework die cut piece coloured with walnut stain and rusty hinge distress ink. I added more rub ons and also added one of the gears from above. I added an idea-ology gear too. For this side i added another piece of framework die cut coloured as above and some stamped elements and some rub ons and a pen nib. For this side ..more die cuts and stamped elements. 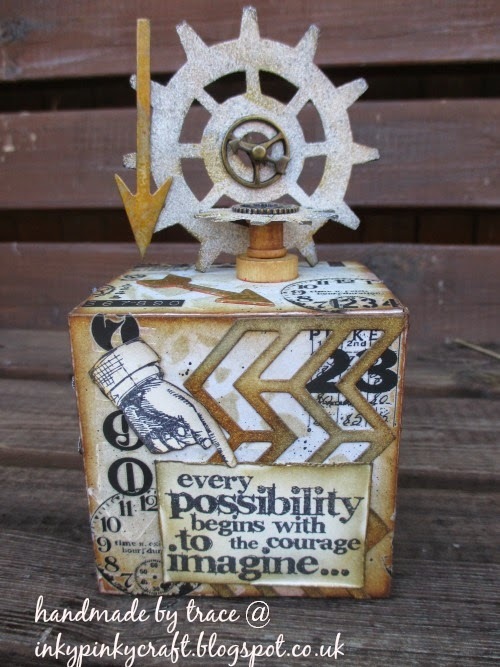 Here are the cogs and gears on the top....I adhered them using bingo pieces and spools to make them dimensional. I added the die cut arrows, some idea-ology and then some rub ons . Hope this shows the dimension. Here is the inside of the box... I added lots of rub ons and some stamped elements and some idea-ology. I added lots the rest of the gears to create the dimension I glued onto more spools and bingo chips...lots of rusty wire, idea-ology gears and some die cut arrows. 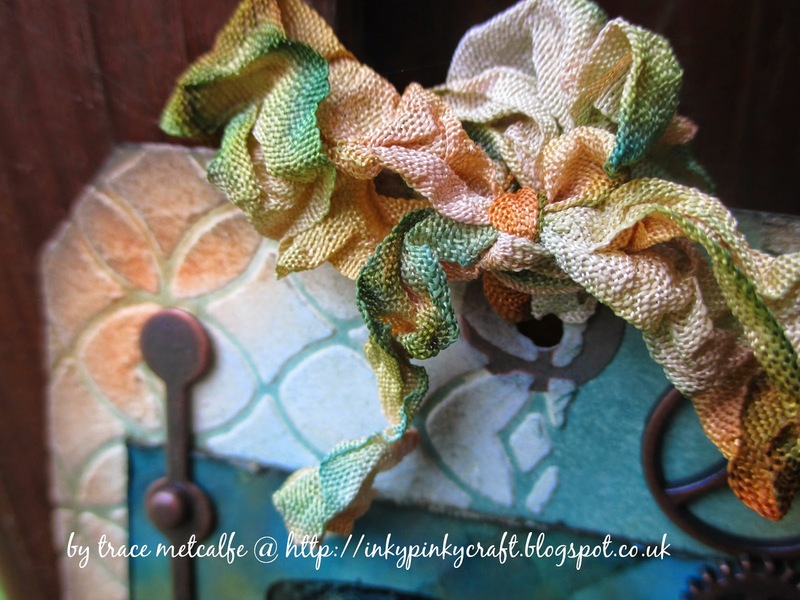 Thanks for taking the time to plough through my post! 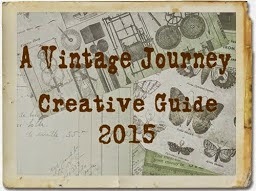 Roll up, Roll up .. sneak peak for CountryViewCrafts. 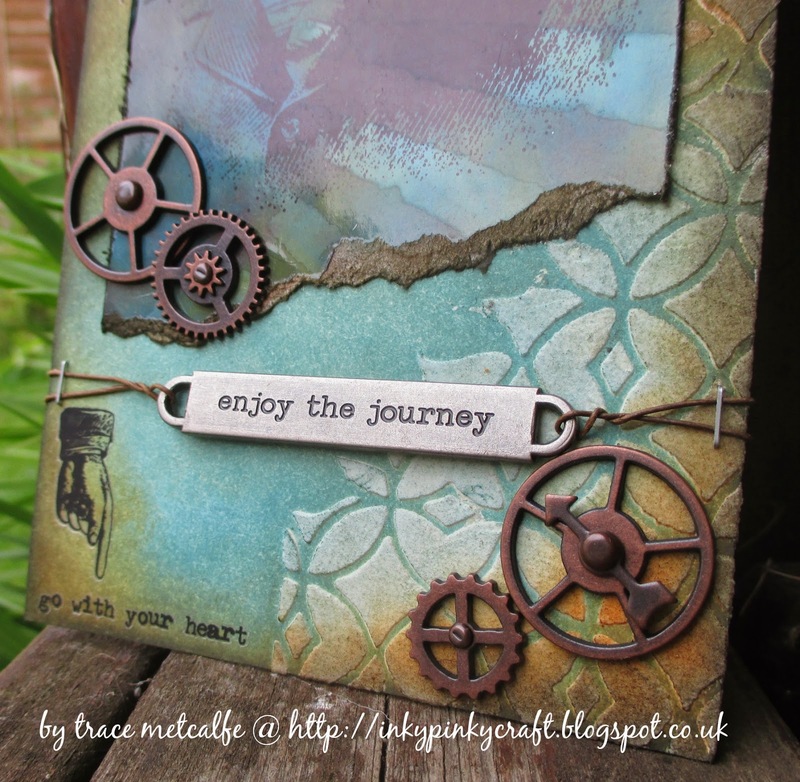 Go with your heart - Dt piece for CountryViewCrafts . 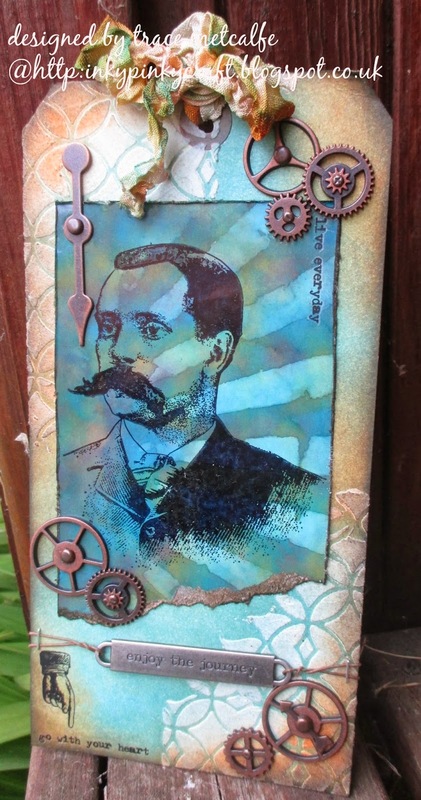 Well all this month over at CountryViewCrafts challenge blog the theme is stencil it and here is my second piece for the month using lots of fab Tim Holtz layering stencils and much more to create my piece . Now usually when I think of stencil it is paste and inks and paints...but I wanted to do something a little different. Ever since Creativity Chemistry 102 ( a great online course by the man himself Mr Tim Holtz ) I have been determined to get my dusty alcohol inks of the shelf for more of a play...so here they are using a technique from the course. So for this I made a layered tag...and used stencils with alcohol ink to create faux bleach effect and also with some paste to create texture on the base layer...here's how : I started by creating the base on my tag by applying texture paste through Tims layering stencil..latticework ...a real favourite of mine..and left to dry. Then when dry I applied rusty hinge and broken china Distress Inks using a blending tool, drying and layering colour until happy ....just love these colours together! When dry I edged the whole tag in rusty hinge and set aside. Just around edges to make colours stand out I added some black soot distress ink. Now for the alcohol inky bit... So to start I selected some blues and browny colours and applied some to my blending tool with alcohol ink felt applied instead of foam. 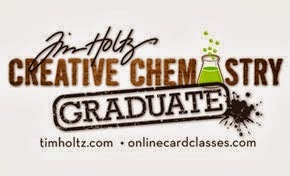 I took a piece of alcohol ink card but lots of glossy card works well. I then applied the colours to my card twisting and turning the tool. I left to dry for a few seconds and then added some more to blend colours and tone down areas that I felt were too dark. Now for the really cool bit...I took a clean piece of felt and applied some alcohol ink blending solution to the felt, placed my layering stencil ( I chose rays ) over the background and dabbed the solution through....waited for a few moments for the magic to happen and removed the stencil. I then trimmed and tore across the bottom ..all ready for the fab man image from Purveyor set. I cleaned my stencil using an alcohol wipe as this removes all residue from blending solution. everytime I play with alcohol inks I wonder why I don't use them more! Do you have things like that? So here are some close ups of the details. I inked the edges of the piece in rusty hinge and black, then stamped the main image using jet black archival and heat set it . 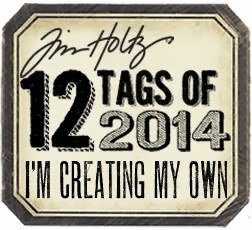 I added to the tag and added a rub on and some cogs...well you know me and cogs! To finish the bottom of the tag , some more rubs ons...a word band threaded on rusty wire and stapled and yes.. more cogs...a girl can never have too many cogs! The top was finished off with some seam binding dyed with rusty hinge and broken china distress stain and I added a spinner on the left. So hope you like my stencilled tag and hope you will have time to join in with the stencil it challenge over at Country View Crafts challenge blog here . Thanks for stopping by and taking the time to leave a comment....so great to be back and inky!